Bright, fresh, and a snap to make, this salad is the perfect starter or side for the lazy days of summer. If you keep a bag of frozen edamame in your freezer and grow your own shiso plant in your garden as I do, you can put this dish together anytime the mood strikes. I love this floral , tangy, crisp vinaigrette also on chilled green beans, fava beans, peas, asparagus, or salad greens. I think you’ll find it’s definitely a keeper to add to your culinary repertoire. This wonderful recipe is from The Breakaway Cook by San Franciscan Eric Gower, who has a knack for using Japanese ingredients in clever, yet simple ways. 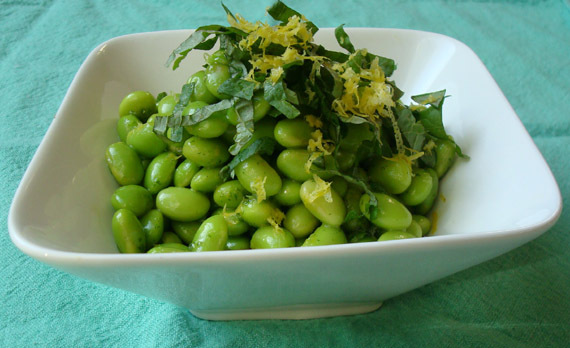 Place edamame in your prettiest ceramic bowl that will hold them with plenty of room to spare. In a blender, mix yuzu juice, half the shiso, the olive oil, vinegar, and maple syrup. Gently mix vinaigrette into the edamame. Add salt and pepper liberally and add remaining shiso. Sprinkle lemon zest on top.